Spectral reflectance is like a fingerprint for the color of a material. If it is available, the color of the material can be predicted or reproduced. There are several methods in color reproduction such as color appearance models and spectral estimation. In spectral estimation we try to estimate the reflectance of a color material as the key factor for its color. For example, when you see a color postcard on the Internet and then receive the actual item, there is typically a difference of color between what you saw online and what is delivered to you. Utilizing data such as spectral reflectance helps us to more accurately reproduce the color that is being seen digitally. However, to date, there is no laboratory instrument in people’s home or offices that enables them to accurately depict this color for every variety of monitors. Product photographs are taken and published and there can be a huge difference between what they see and what they get. To depict color more accurately, it is important to make the color device independent, i.e. to have some standard data like CIExyz instead of RGB values which are limited and independent from the imaging devices. In this case, I characterized a digital camera and found a conversion matrix which can convert the RGB data from the camera to the standard CIE color values. To do this, I use the Munsell color system. I captured photographs of standard Munsell samples and derive a relation between the standard color values of the Munsell samples and the RGB data of their image from the camera. I then use this data to estimate the spectral properties of many test samples. Using Principle Component Analysis (PCA) method I also calculated the eigenvectors of the 1269 standard Munsell color chips from their spectral reflectance factors so there can be some basic functions working as a coordinate system for the whole color gamut. I have utilized this camera characterization technique in order to protect films from digital theft while they are being shown on the screen in theatres. 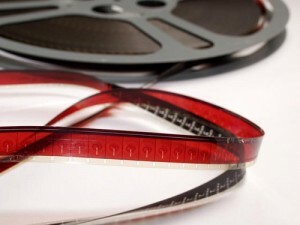 Patrons may attempt to record a film in the theatre using a camcorder. There are many ways to deter this practice, like watermarking and camcorder jamming that may prevent them from doing these illegal acts. I choose to use the difference between the visual systems of the human eye and a camcorder, and the concept of metamerism to make a film which can be seen normally when viewed, but produce a distorted color when it is recorded. I used Munsell colors to characterize my test camera, which helped me to estimate the sensitivities of each color sensor. It is a wonderful world and it is not without color. Learn more about Amir’s process in the publication, Color Research & Application: Cinematic-Film Protection Using Metameric Blacks.